NASA has just released the first batch of images taken by the WISE spacecraft showing several astronomical objects glowing at infrared wavelengths. The level of detail in those images is really quite impressive. They got me thinking about the best infrared images of celestial subjects that I’ve seen in recent years. 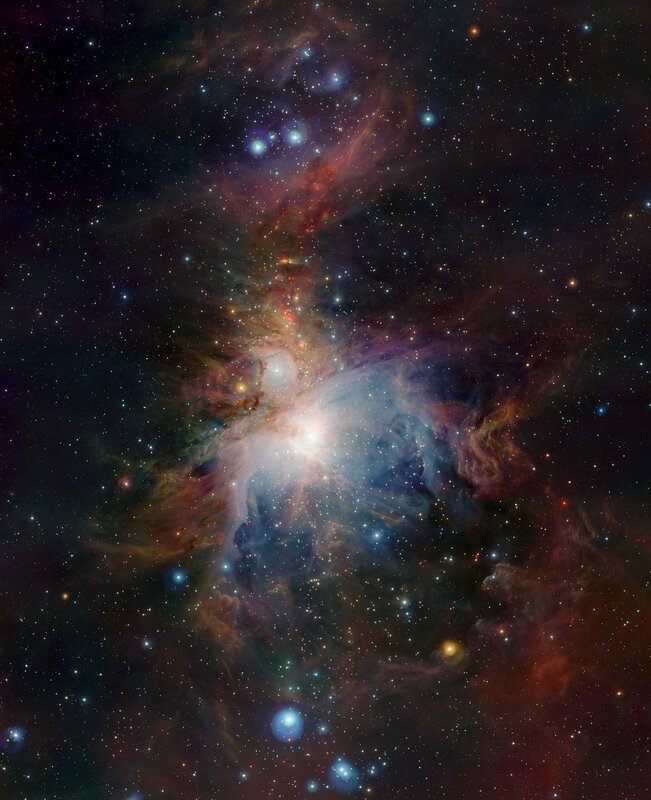 Infrared telescopes are vital tools for astronomers. Observing at infrared wavelengths allows them to see through dust and gas, revealing regions of astronomical objects that may be obscured from view at other wavelengths (like ‘visible light’ that you and I can see). Similarly, powerful infrared telescopes are able to reveal the farthest galaxies in the Universe, allowing astronomers to study how the earliest galaxies evolved. I’ve put together ten of my favourite infrared space images below but what would your top ones be? Have I missed a real cracker? Let me know in the comments below, or drop me a tweet. Clicking on the images will take you to the big versions (and be warned I mean big!) whilst clicking the title of the picture takes you to a news story about the science behind it. One section of the Eagle Nebula was made famous by the Hubble Space Telescope image dubbed the ‘Pillars of Creation’. Can you spot the ‘pillars’ glowing in this image from the Spitzer Infrared Space Telescope? Infrared radiation reflected off Saturn reveals the Ringed Planet in this view from the Hubble Space Telescope. M81, also known as Bode’s Nebula, is a galaxy in the northern hemisphere constellation of Ursa Major and is a fine sight in a small telescope. 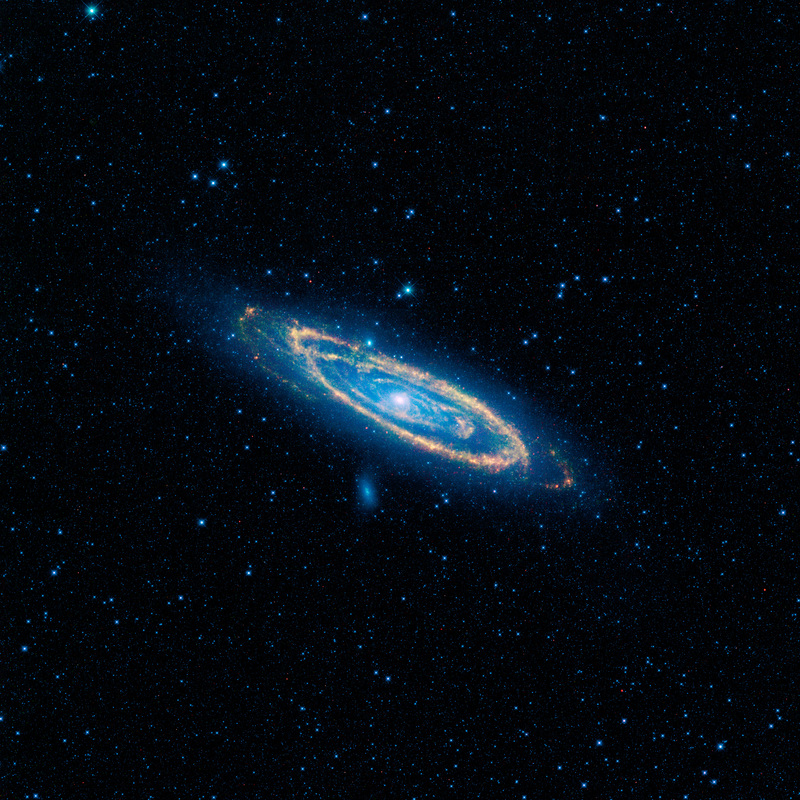 Dust clouds within its spiral arms are revealed in red in this picture. A 900 lightyear diameter region towards the heart of the Milky Way is shown in spectacular detail in this panoramic image from Spitzer. It might look like the eye of an angry monster staring back at us but this is in fact a planetary nebula – a huge ejected shell (or series of shells) of gas and dust created towards the end of a Sun-like star’s life. The Pinwheel Galaxy lies 27 million lightyears away from the Earth in the constellation of Ursa Major. Its beautiful twisting spiral arms shine brightly in this detailed image. The Orion Nebula (M42) at the centre of the Sword of Orion is one of the finest night sky sights through binoculars or a small telescope. This image from the European Southern Observatory’s VISTA telescope however reveals regions of the nebula that amateur astronomers cannot see. At a distance of roughly 2.5 million lightyears away the Andromeda Galaxy is one of the nearest galaxies to the Milky Way. Young stars in its spiral arms glow yellow in this image from the WISE telescope, whilst older stars are represented with a blue hue. Myriad stars sparkle in this image taken using the European Southern Observatory’s Very Large Telescope. 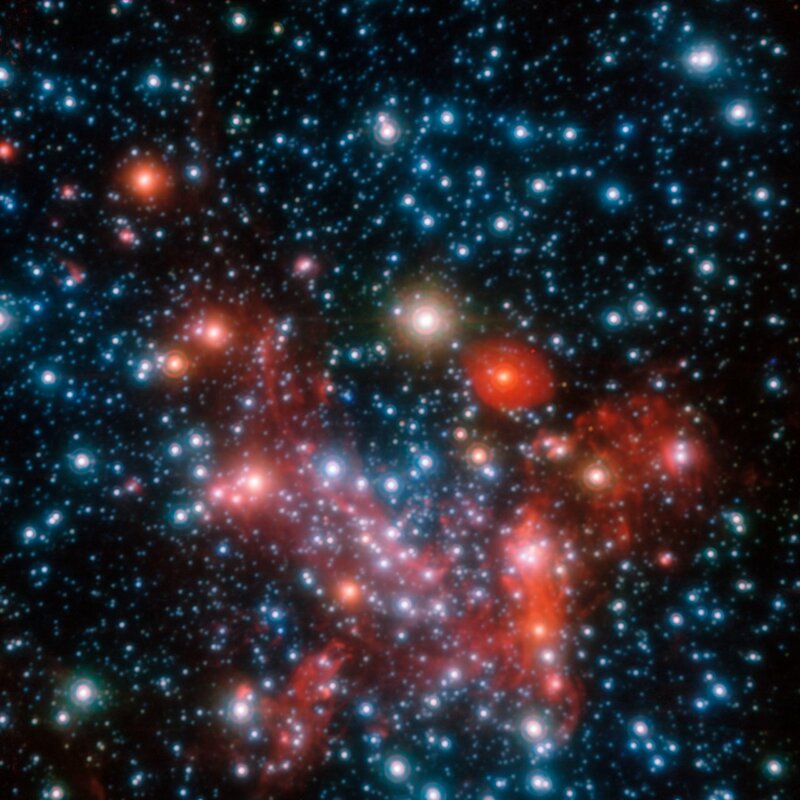 It’s thought that hidden within this region (the central region of the Milky Way) is a supermassive black hole. The Pleiades star cluster is a familiar sight to amateur astronomers observing the winter night skies. This image from the Spitzer Infrared Space Telescope shows the vast cirrus like dust clouds which currently surround the stars of the cluster.